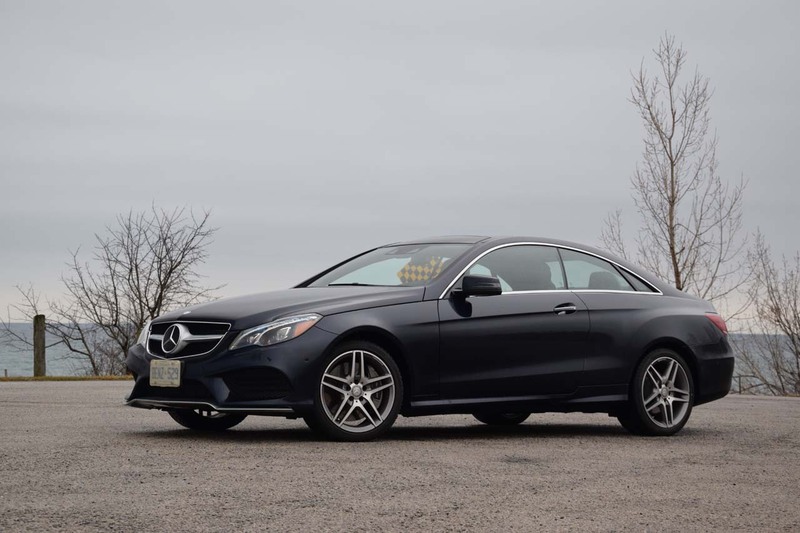 Two door coupes are probably my favourite kind of cars, especially when they are rear-wheel-drive and come with a big powerful engine. 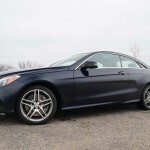 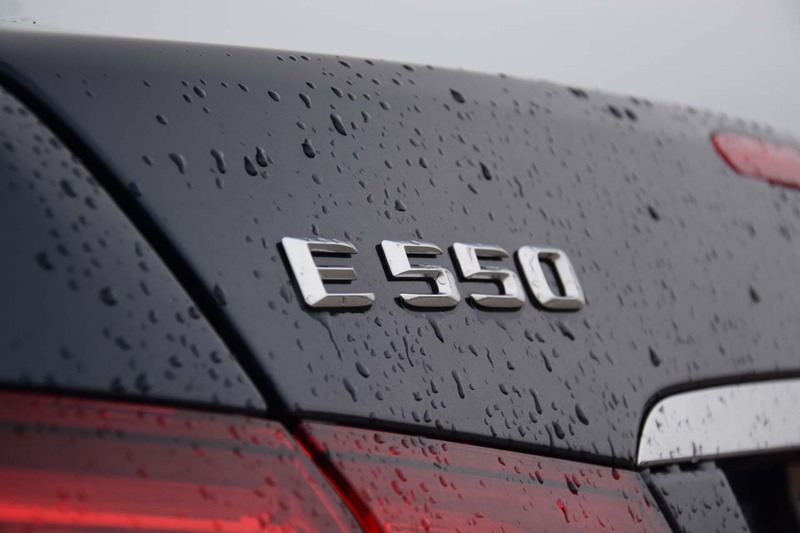 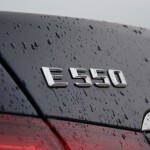 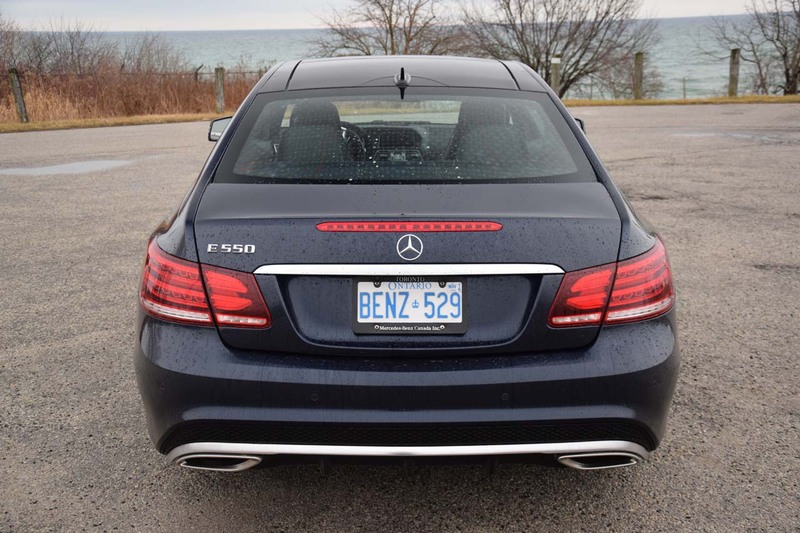 The Mercedes-Benz E 550 Coupe might not be the first car that comes to mind in the segment, but it is a very charismatic vehicle with lots of interesting facts about it. 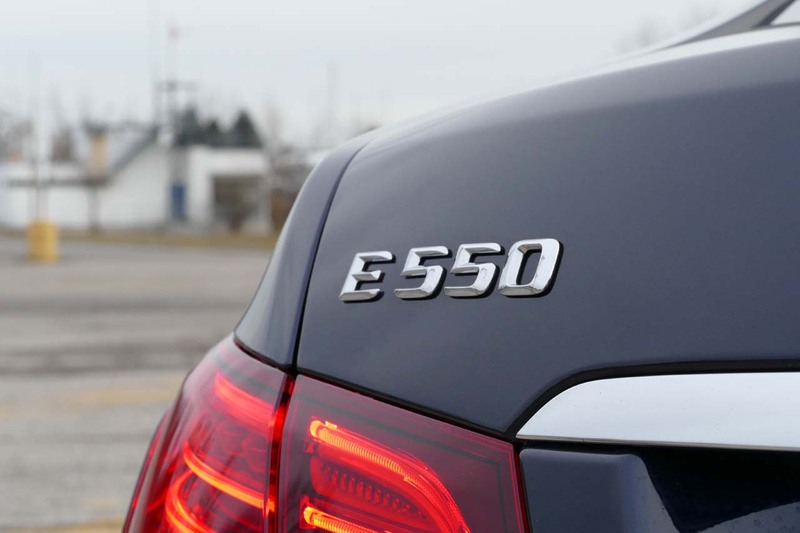 The E 550 comes is exclusively rear-wheel-drive and it has a big V8 on the other end. 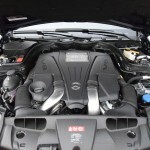 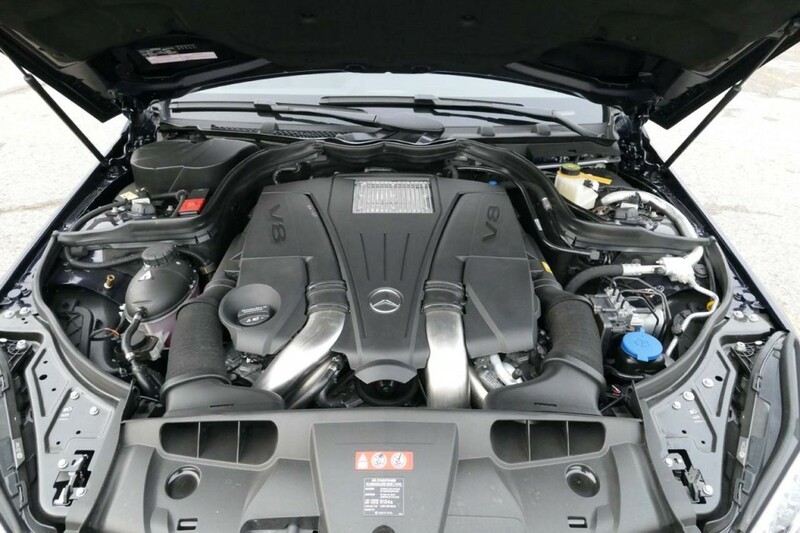 Best of all, that big V8 has two turbos attached. 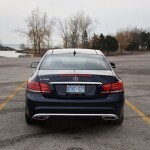 Needless to say, based on its specs, this thing should fly. 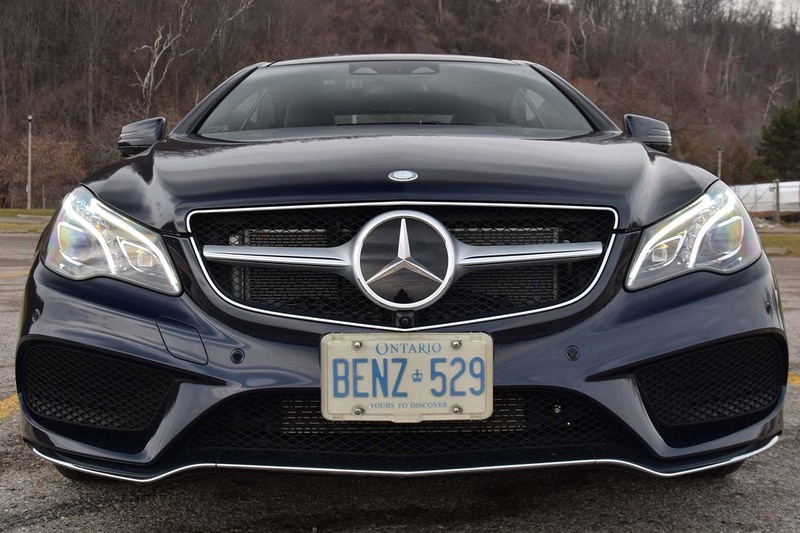 The big deal about it is that no immediate competitor comes with a V8, and no, Camaros and Mustangs are not in the same class and neither are top performance models like the Lexus RCF. 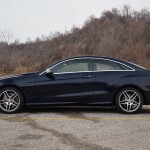 The main rivals are of German origin, and are the BMW 4-Series and the AUDI A5, but the ATS Coupe also kind of falls in the same bucket. 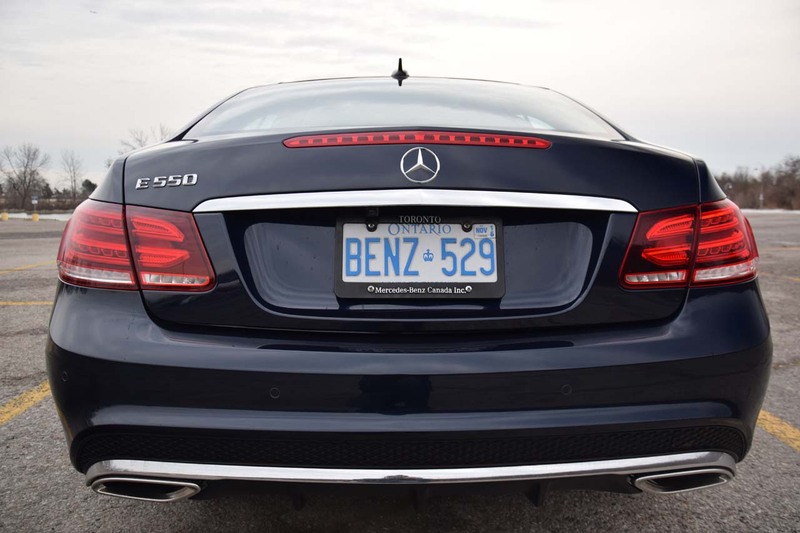 The E 550 is very competitively priced, as the base price is $74,500 and even the loaded specimen that was given to us was only $6,200 more. 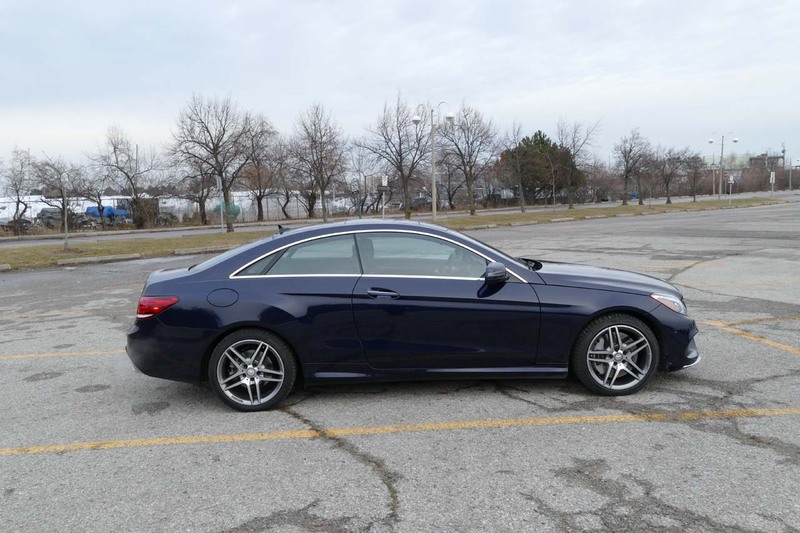 The gear onboard is very generous, featuring a gorgeous AMG Styling package with 18” AMG wheels, 10-way power adjustable front seats with memory, heated and ventilated front seats, Nappa leather dashboard, panoramic sunroof, SIRIUS satellite radio, karman/kardon LOGIC 7 surround sound system, COMAND online navigation with MB Apps, rear view camera and 360 view, keyless entry with start button, adaptive high beam assist, attention assist, tire pressure monitors, hill start assist, seven airbags including one for the driver’s knees, auto lights and wipers, front seatbelt handover, weight sensing system, blind spot monitors, active lane keep assist, ECO start/stop system, stability control, active park assist, heated windshield washer system, DISTRONIC adaptive cruise control with steering assist, active LED high performance lighting system, AGILITY CONTROL suspension and a sport multifunction leather steering wheel with paddle shifters. 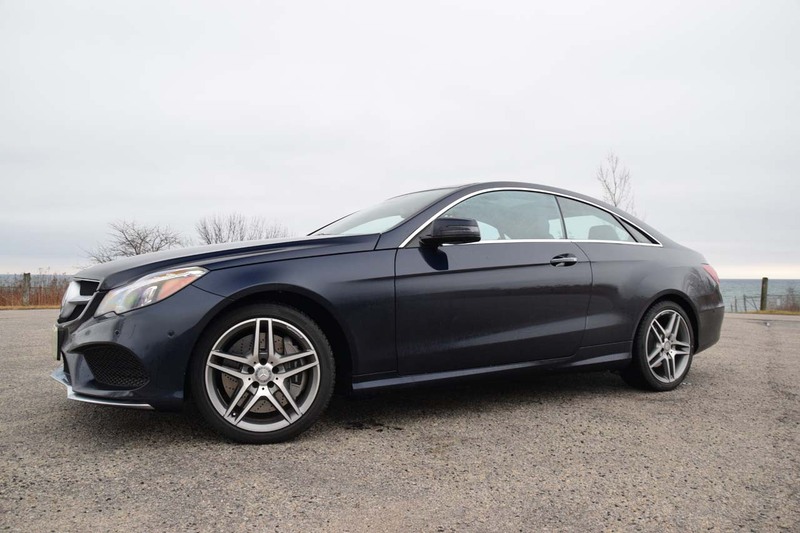 From a distance, it impresses with its curvy roof line and its low belt line, and especially those glutes at the rear pose with a very athletic stance. 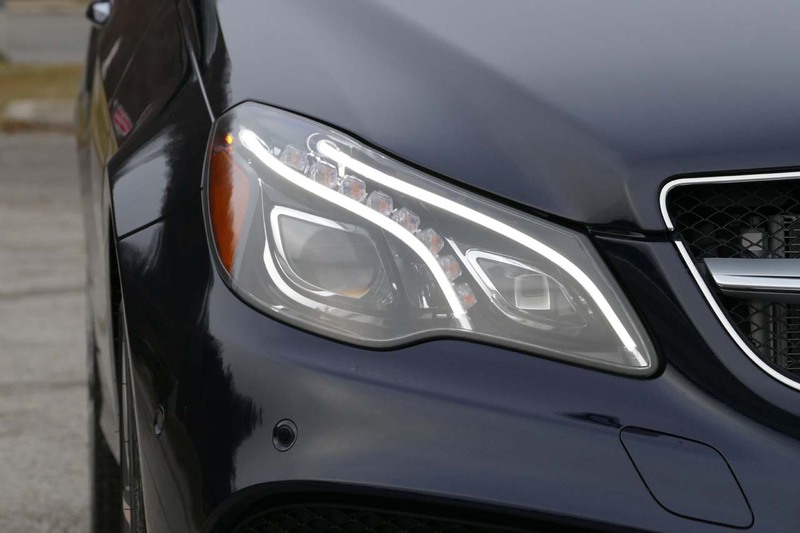 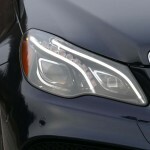 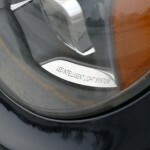 The updated LED headlights look very appealing from up close and the front lip spoiler is very aggressive. 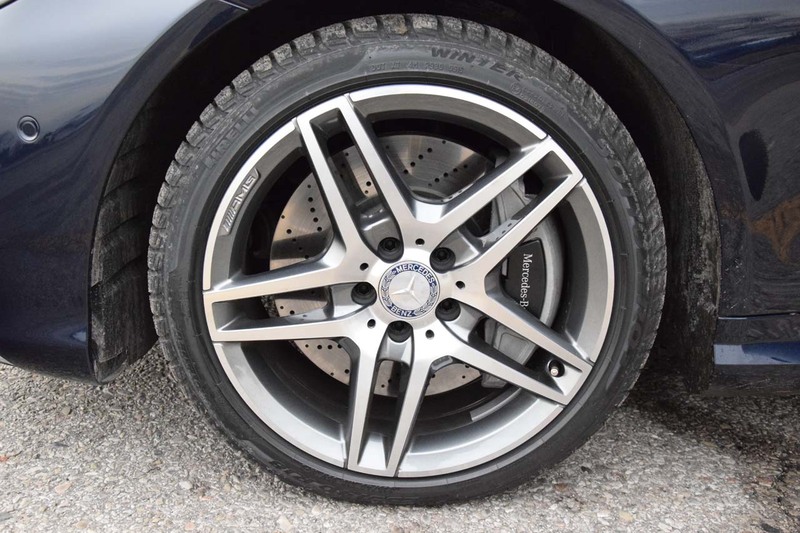 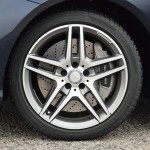 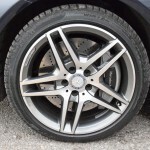 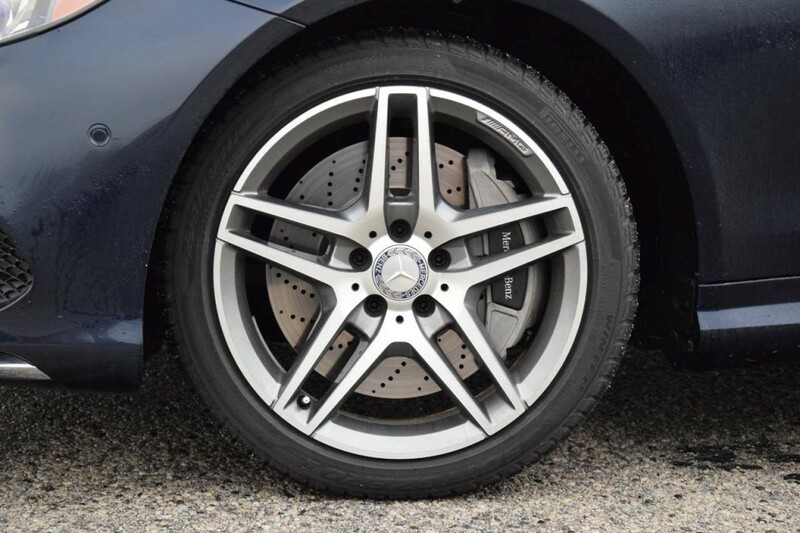 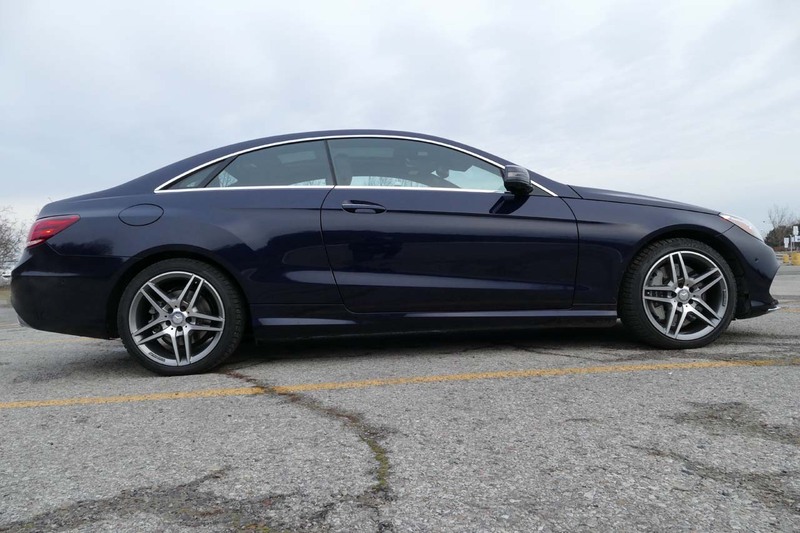 On the 18” AMG wheels, this coupe looks like a very nimble and quick sports tourer, which is exactly what it is. 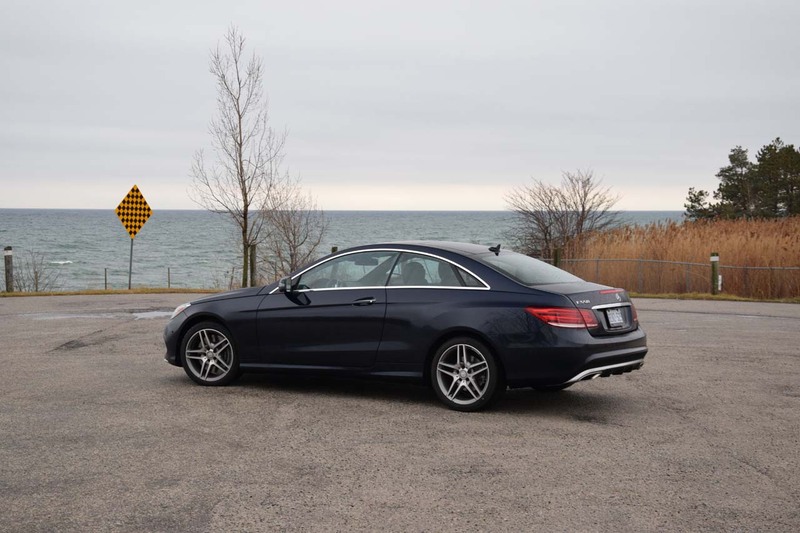 The E 550 Coupe is a car that hardly goes unnoticed and is very popular amongst buyers that value image more than anything else. 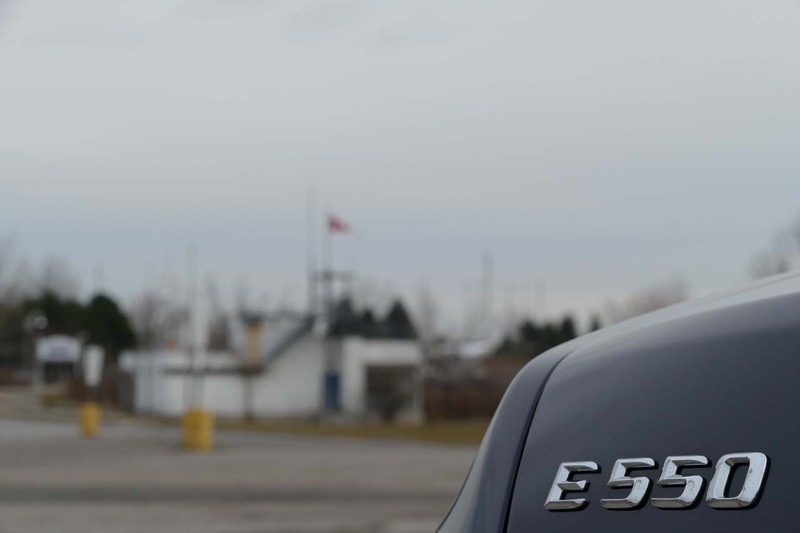 Inside, the story is a bit different and a lot more conservative. 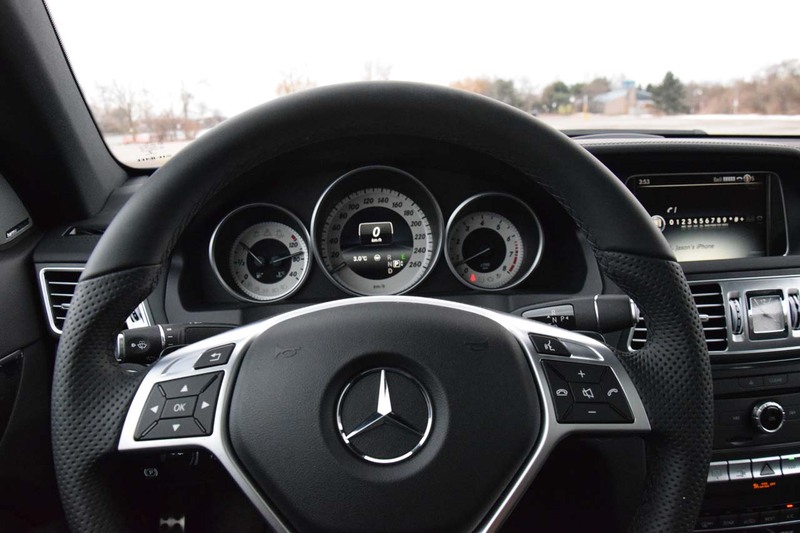 That is not a bad thing per se, since all the usual Mercedes elements are present including top quality materials, excellent fit and finish and well thought through ergonomics. 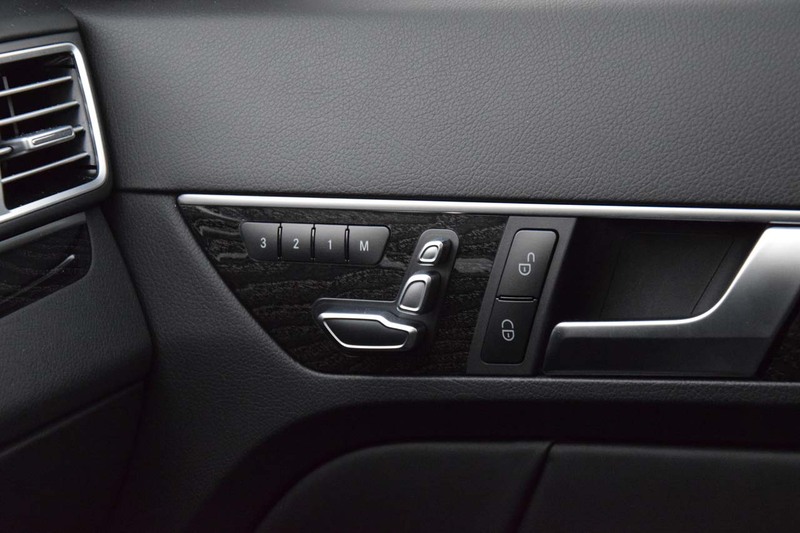 The design is elegant and simple, they went about without over-complicating things and it is evidently focused on usability and luxury. 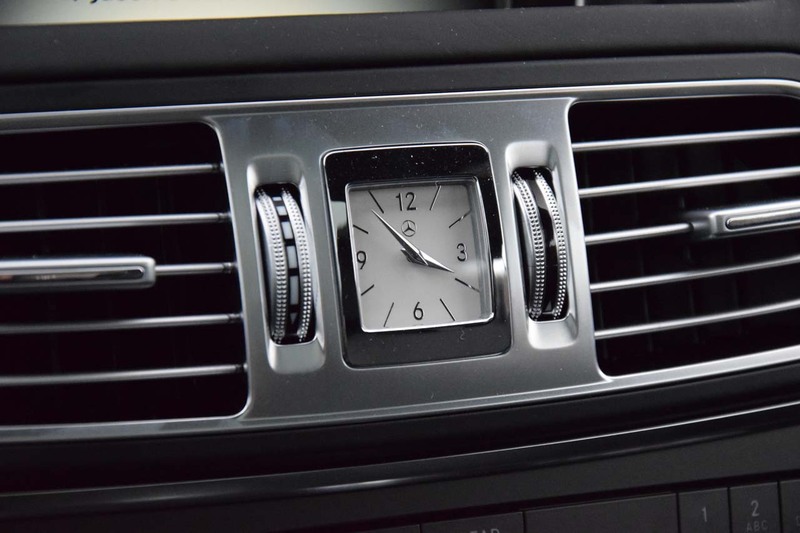 The analog clock adds the splash of required luxury and the COMAND navigation and infotainment system controls are easy to use and effective on the go. 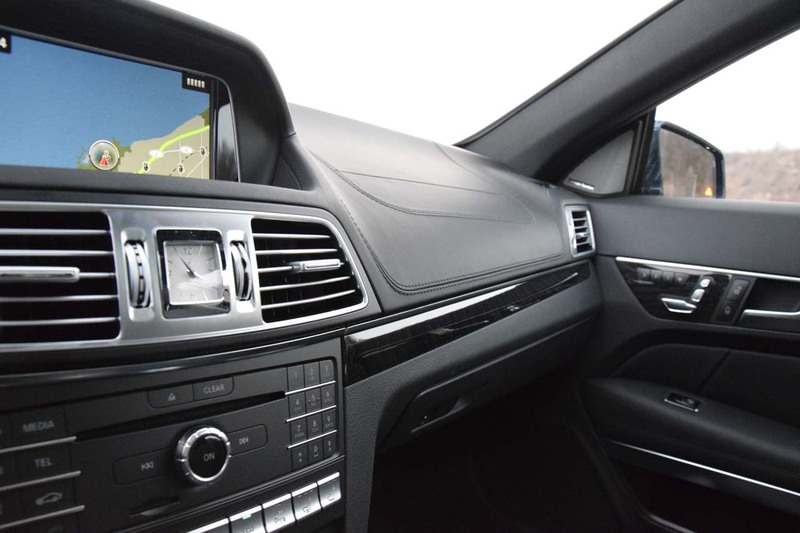 The driving position can be set to accommodate a very wide gamut of drivers and when set correctly, it is properly rewarding and delivers a good connection between driver and machine. 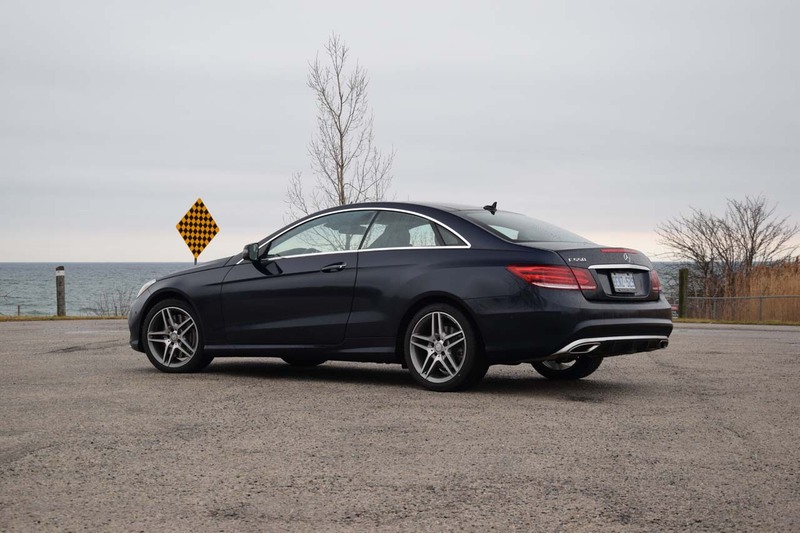 The lack of a B-pillar makes visibility excellent, but for the harder maneuvers, the fantastic 360-degree camera system helps a bunch. 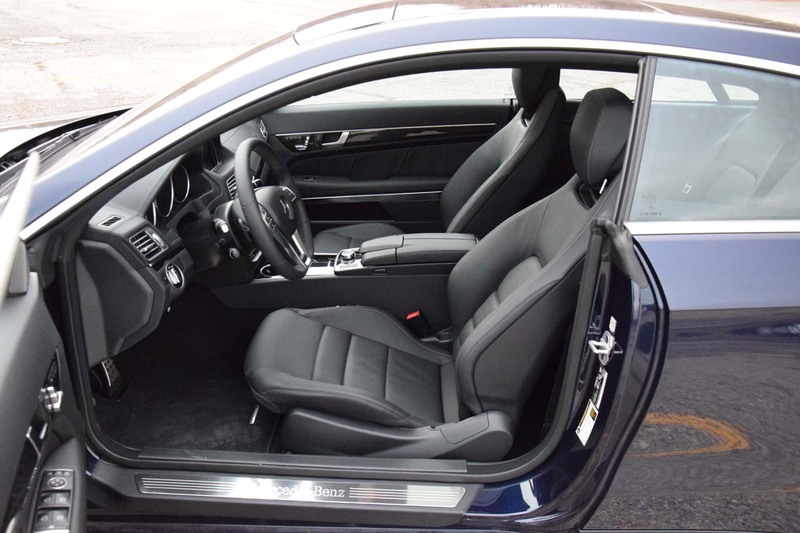 The seats are very supportive and comfortable and come with a large number of possible adjustments. 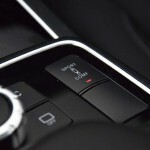 I am not a huge fan of the analog switches controlling the support functions, as they are easy to nudge out of place. 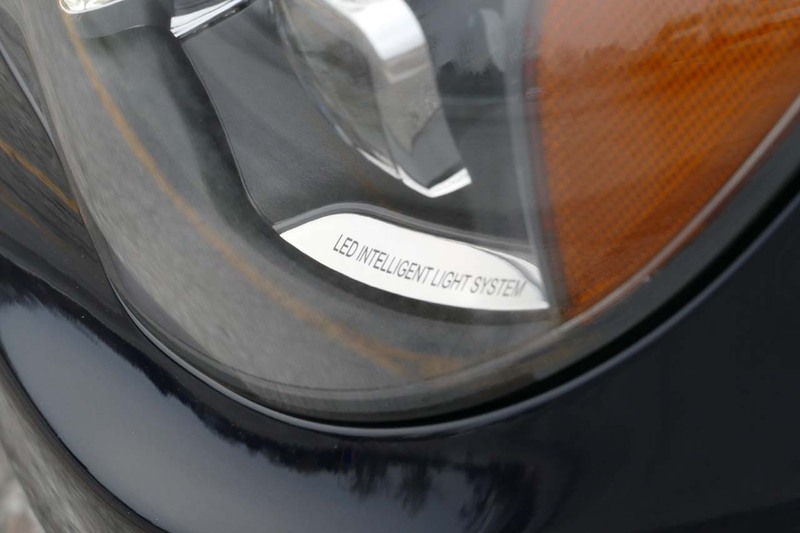 They are very precise though, so I definitely see the reason behind the idea. 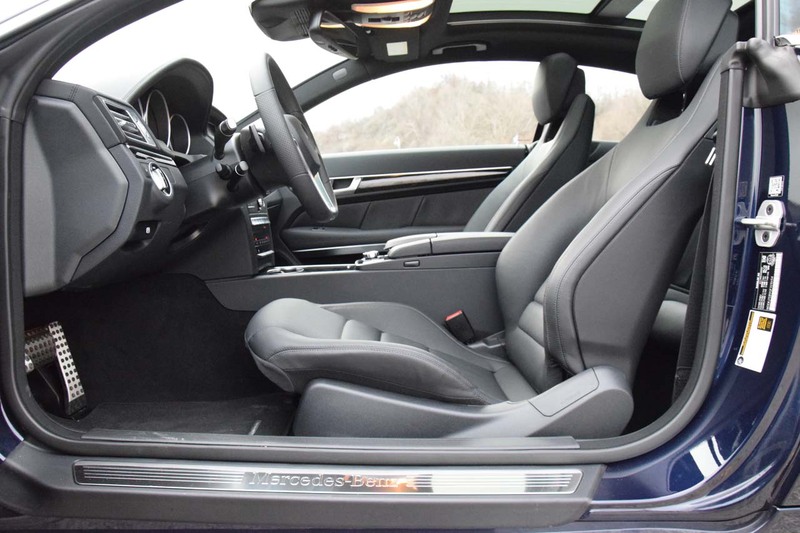 Roominess is really good for a driver and passenger, it really does feel like a gran tourer in terms of refinement and accommodation. 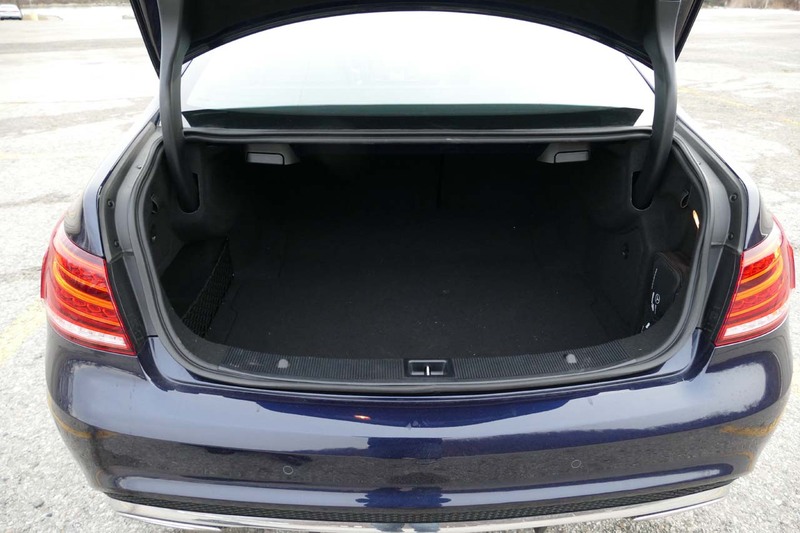 The rear seats might be a bit hard to access, but once you are in there, they are quite comfortable for humans with an average build. 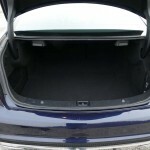 The trunk, at 450 L is quite big and should satisfy most loading requirements with ease. 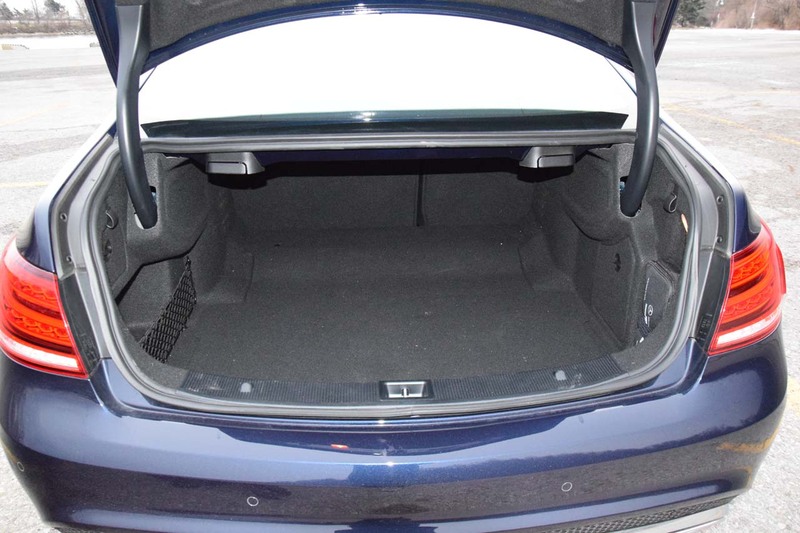 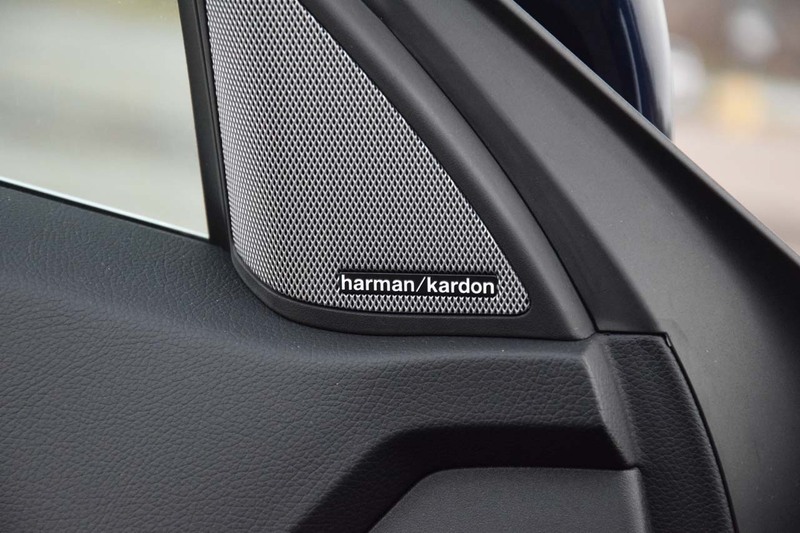 Also, the rear seats can be folded in a 60:40 configuration, improving practicality and loading options. 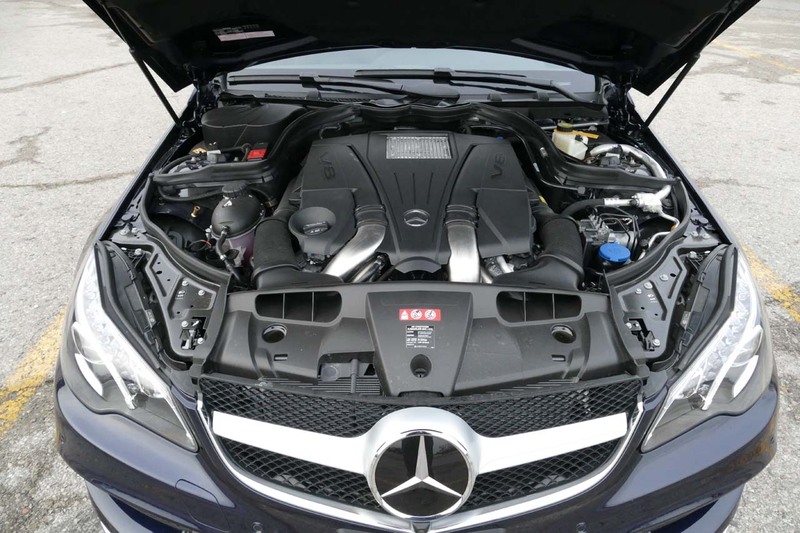 The sweetest element of the whole package is without doubt the calm power gushing out of the fine tuned Bi-Turbo 4.6L V8 engine. It is utterly impressive how such a calm – silent purring engine can transform itself into a tyrannosaurus rex as you squeeze in the right pedal. 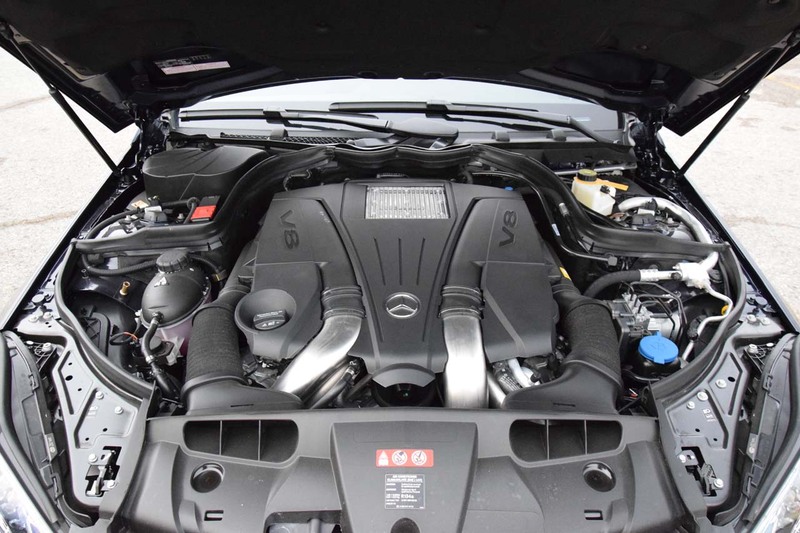 It sounds amazing and it performs like an animal; oh the sweet rumble. 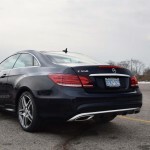 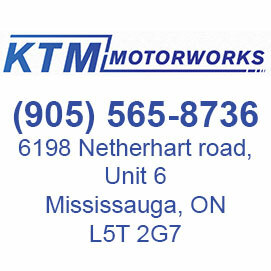 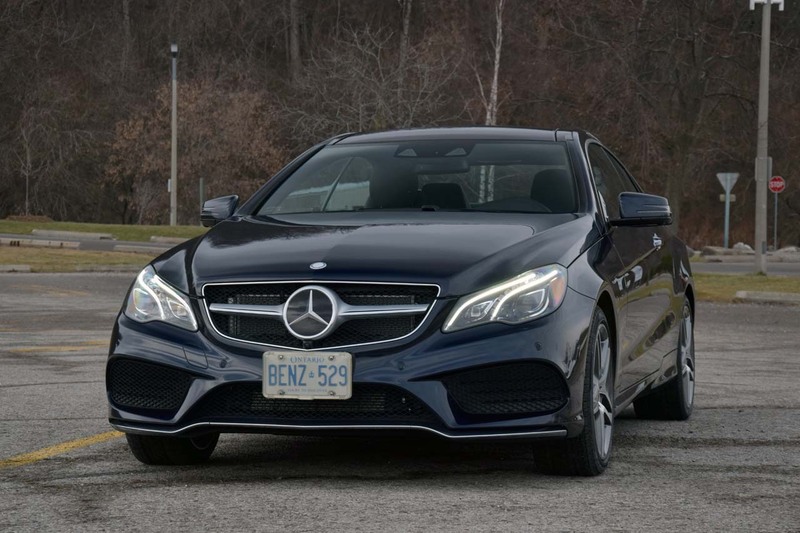 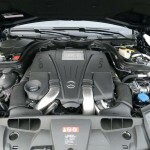 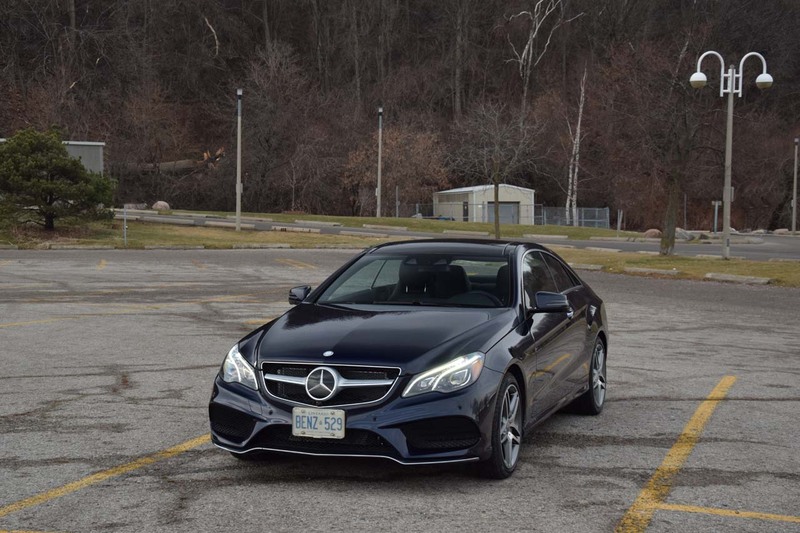 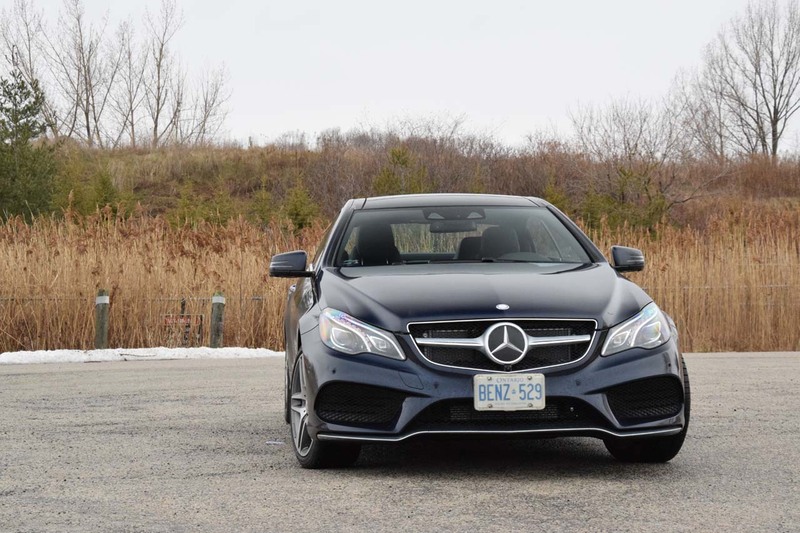 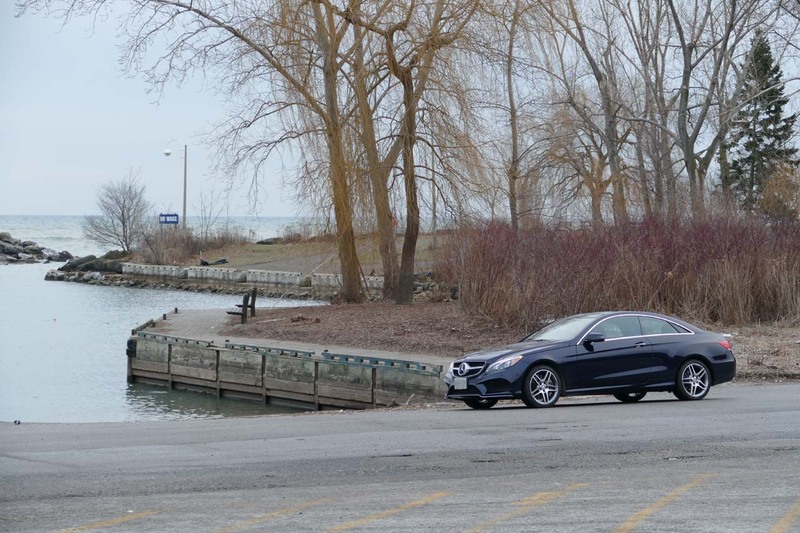 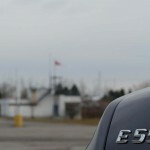 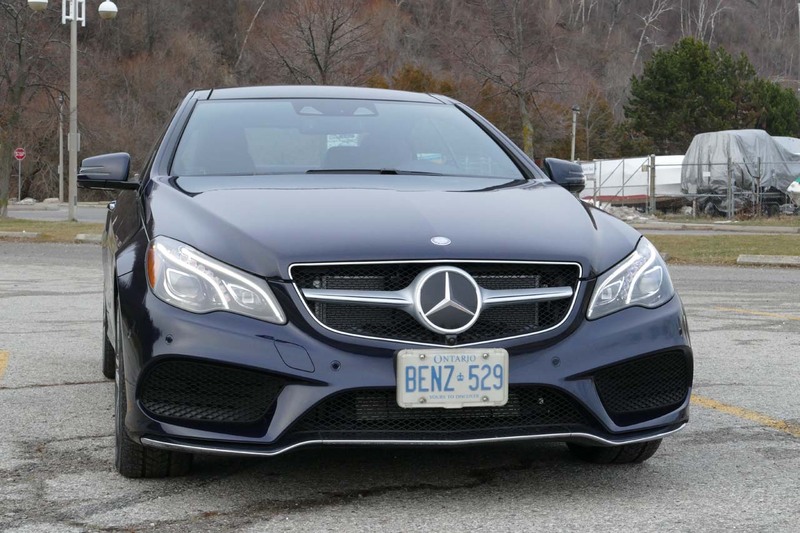 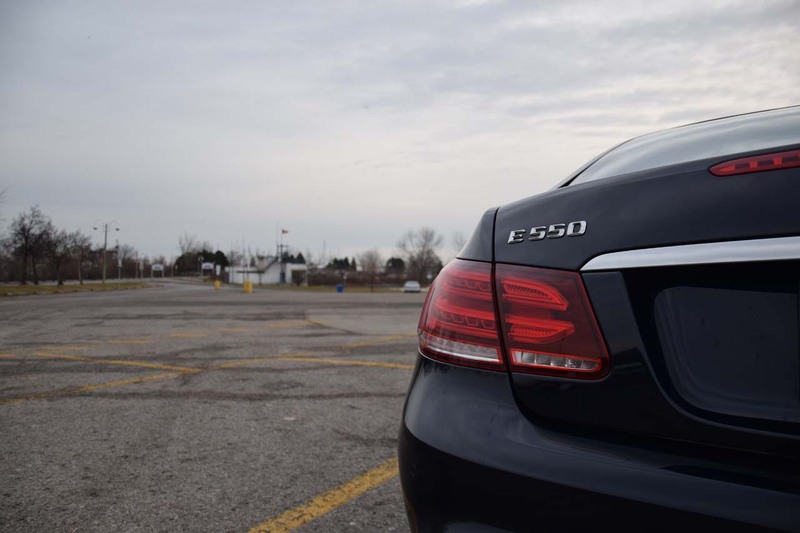 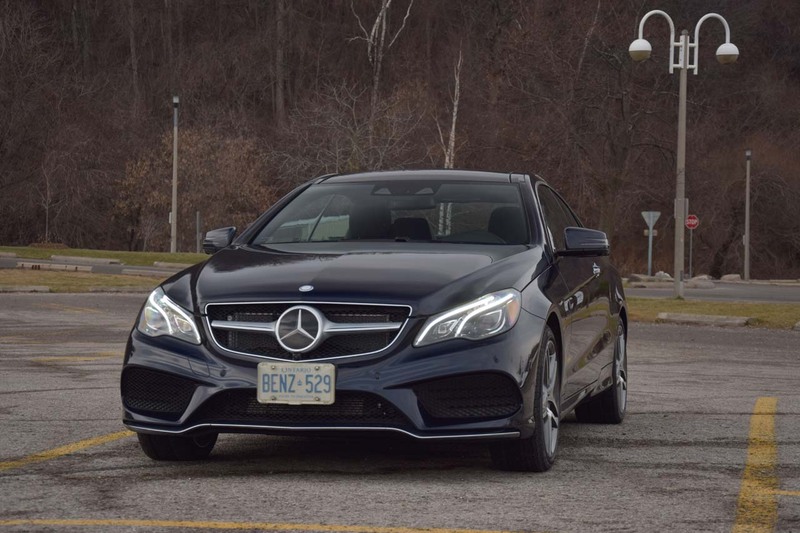 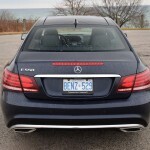 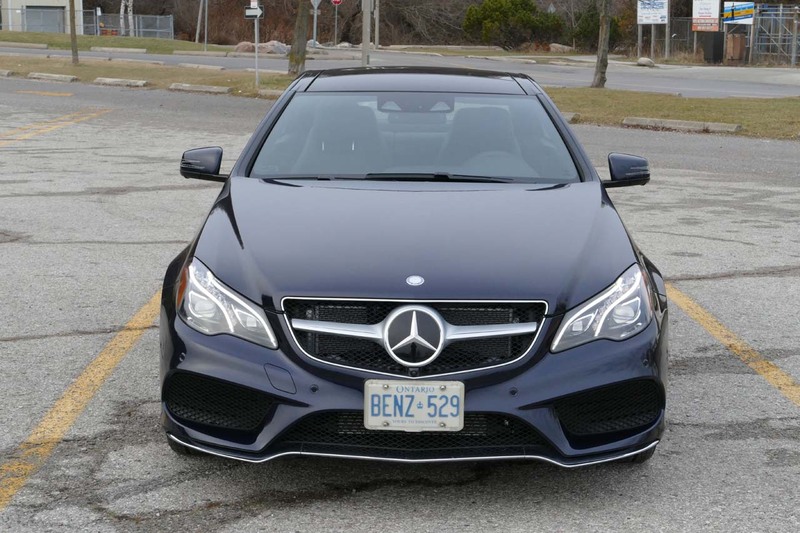 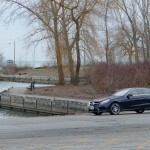 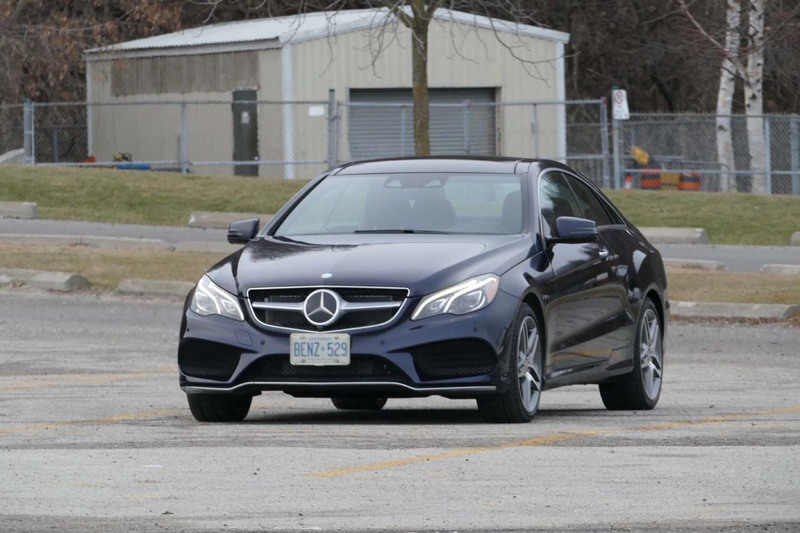 Throttle response is quicker than diarrhea, pulling power is neck-breaking and the E 550 can easily hit 100km/h in 6.1 seconds on salt-infested roads and on winter tires, while the factory claimed number is just 4.8. 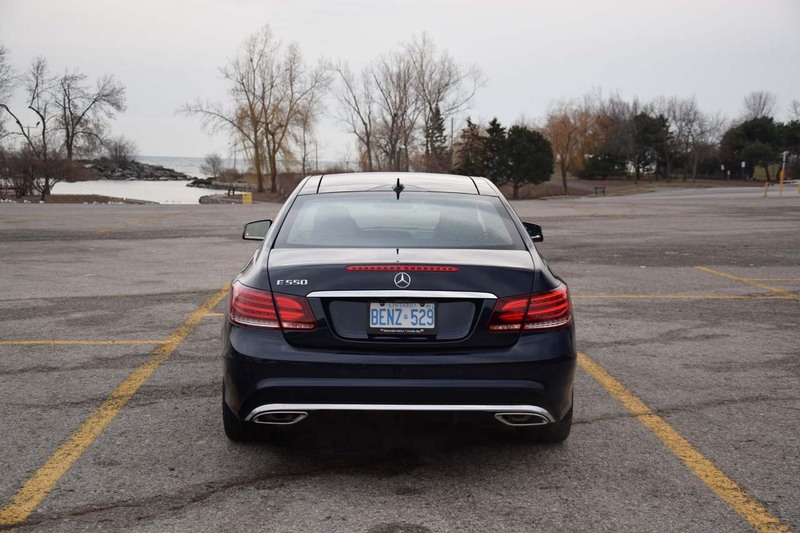 At the same time, our combined average fuel economy was a very reasonable 12.5lt/100km. 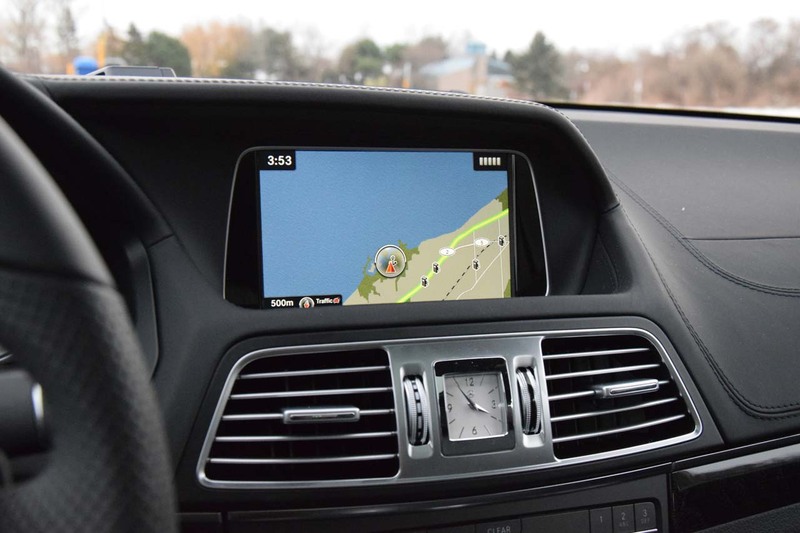 The driver assistance systems are really well implemented, they are not intrusive at all and they actually help you understand how to drive properly. 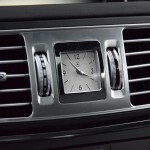 That is if you respect the reason they are present, cause if you just let go and start texting, then you are just a ticking time bomb. 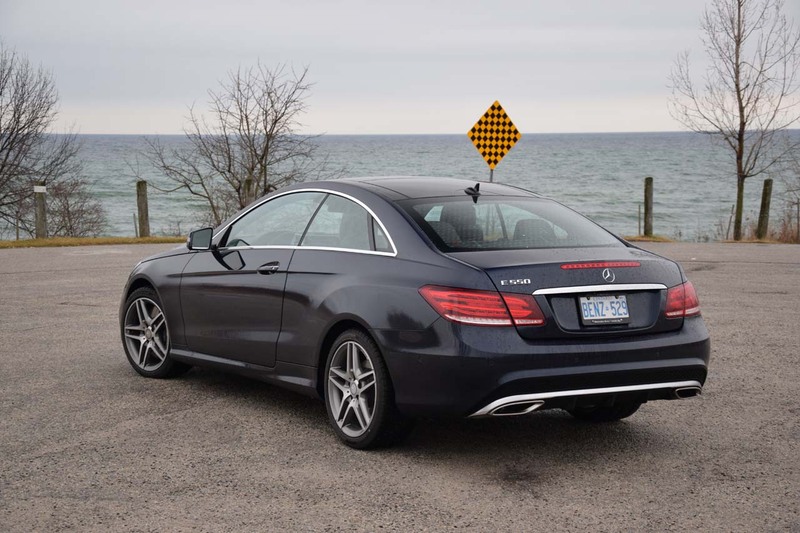 Also, I usually don’t like adaptive cruise control systems cause they slow you down without it being apparent, but this “Distance Keeping Tronic” does a great job telling you how slower the car in front is going as you creep up and will very happily accept on the fly throttle. 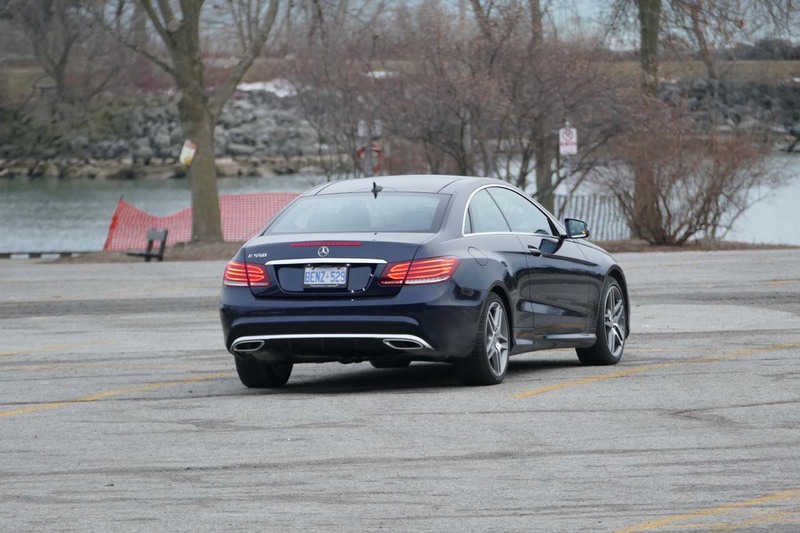 Having so much power is not really an issue for the handling, as the AGILITY CONTROL adaptive suspension does an amazing job keeping it on the road. 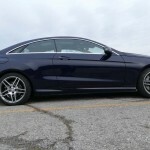 It makes it feel like putty in the hands of even the inexperienced, as it is so brilliantly easy to drive fast and safe. 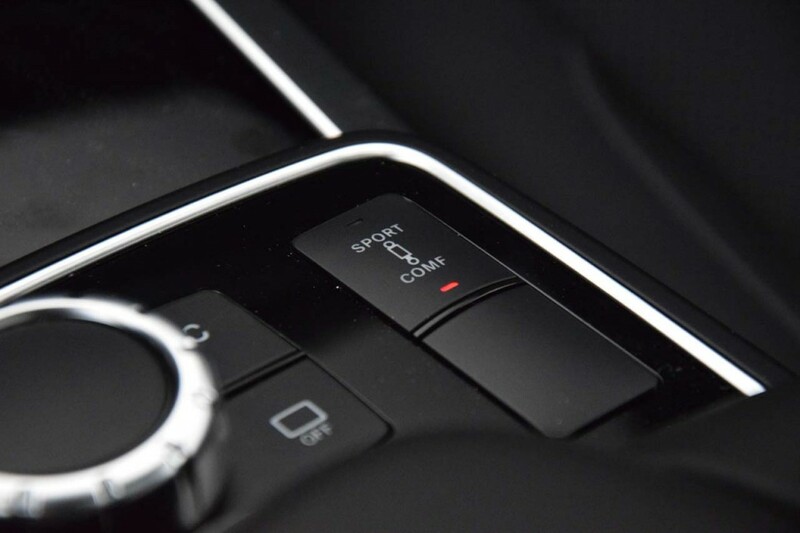 The steering feels great and delivers good feedback, while the seat is very informative as per grip limits and body reactions. 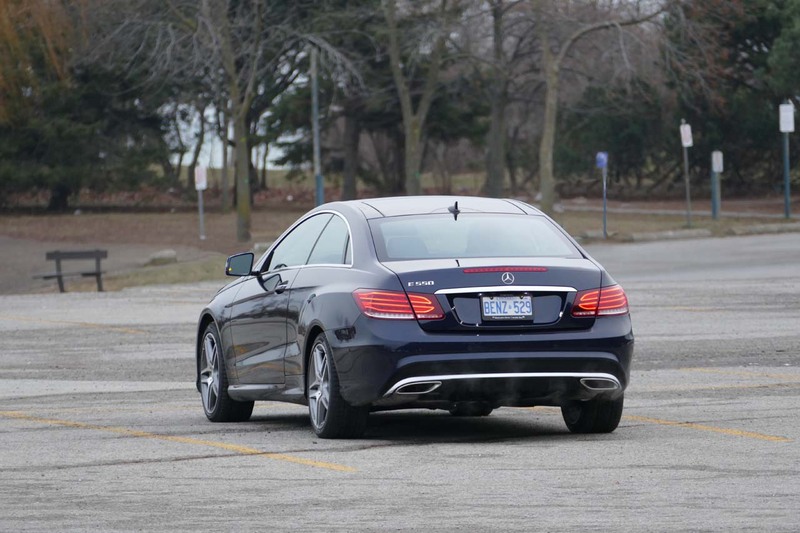 Turn-in is sharp, initially with slight understeer that can be transformed into oversteer of more throttle is applied. 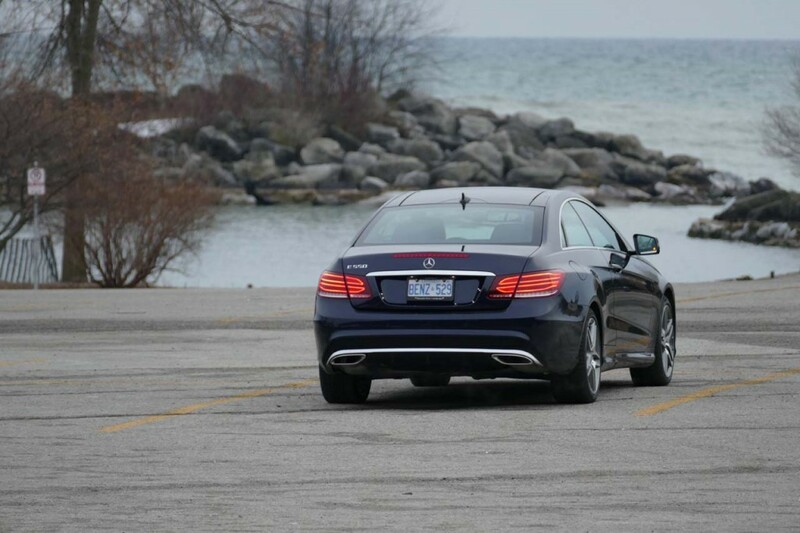 A good balance mid-turn is easy to achieve, and the car feels very athletic overall. 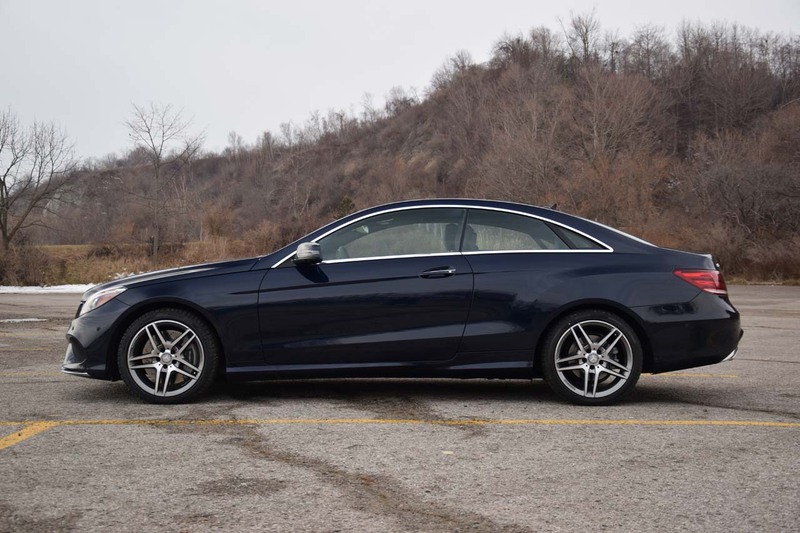 Let me put it this way; If you would be about to drive on a twisty back road and this was the car to do it with, it would surely be what most would call “a good day”. 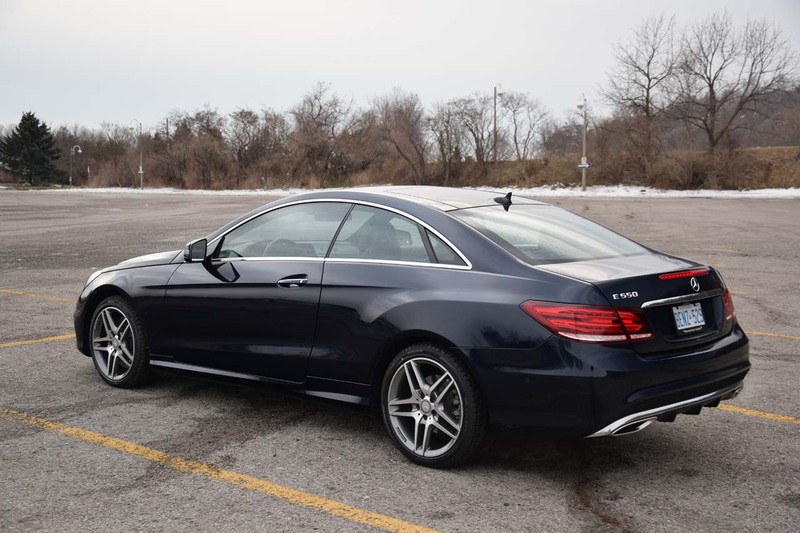 Of course, being an elegant coupe, ride comfort cannot be discarded and it actually matters quite a bit. 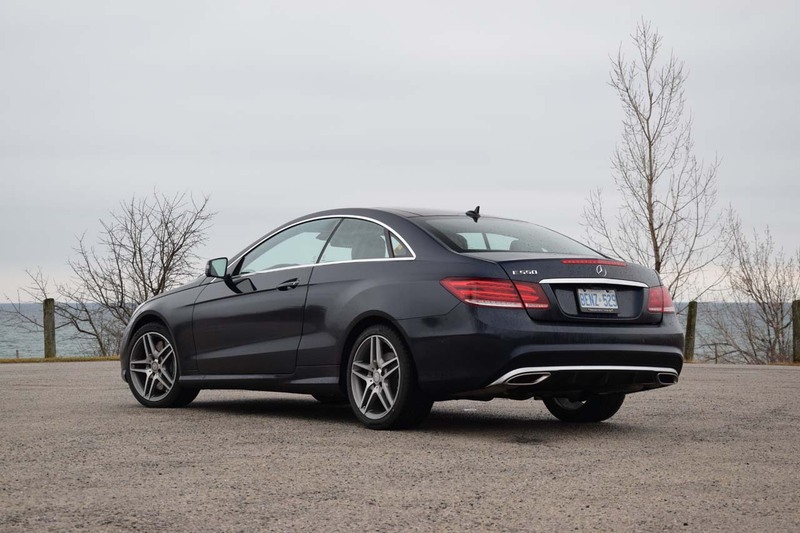 Thankfully, once again, the firms adaptive suspension feels like a million dollars. 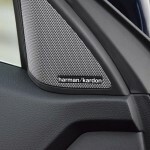 In comfort mode, it is soft enough to deal with the toughest road imperfections making the car feel like a magic carpet. 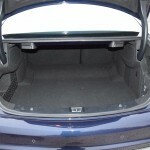 Best of all, there are no unwanted noises produced making ride quality score very high. 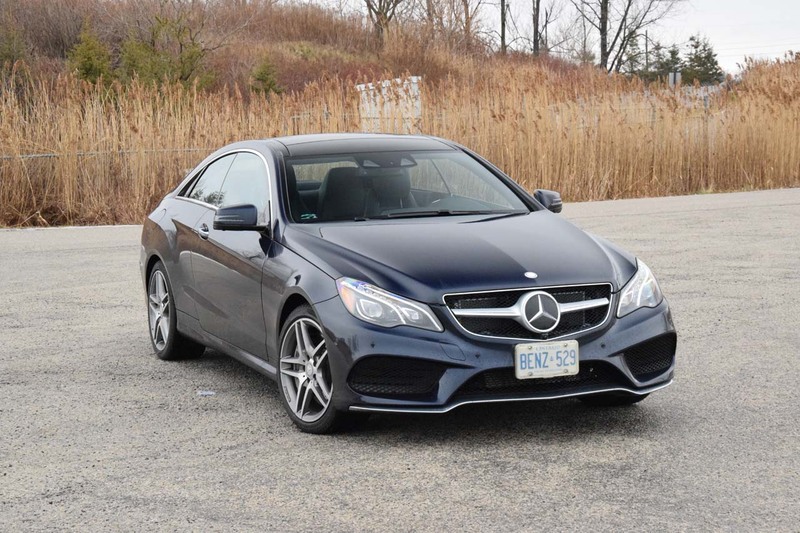 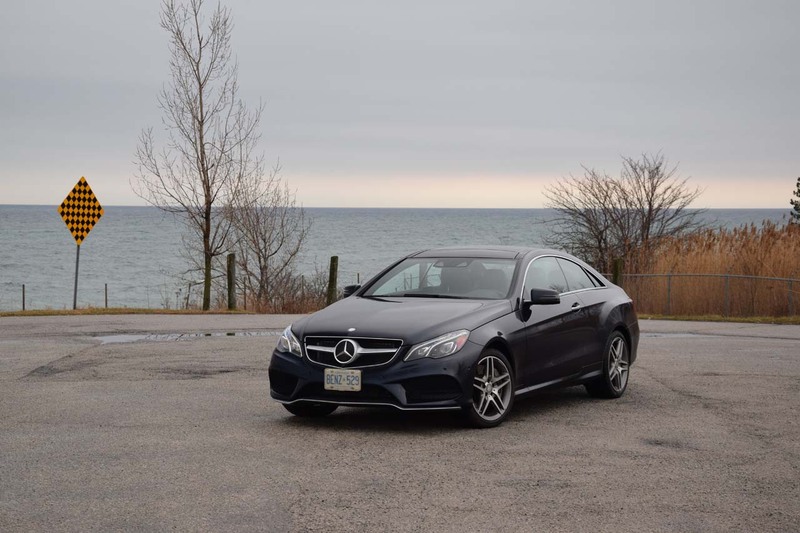 In a niche segment of the market, the E-Class Coupe has a few aces up its sleeves helping it stand out and claim its territory. 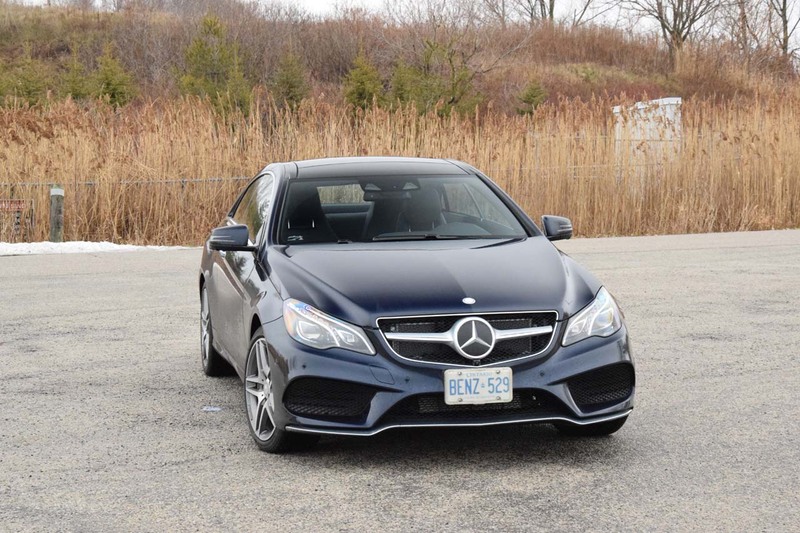 Refinement, performance and prestige are values held very high here and most customers shopping at this price point are not willing to compromise for anything less. 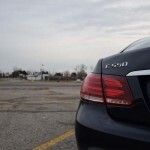 Thankfully, the E 550 is a solid performer and also delivers pure class. 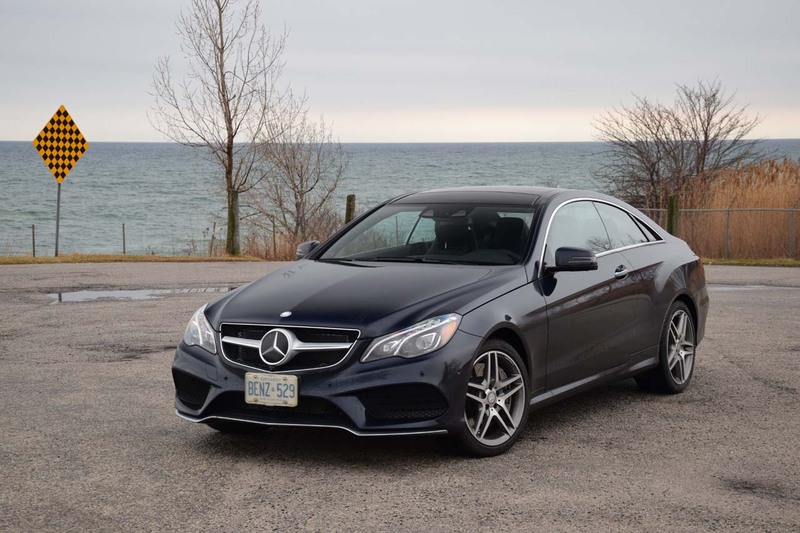 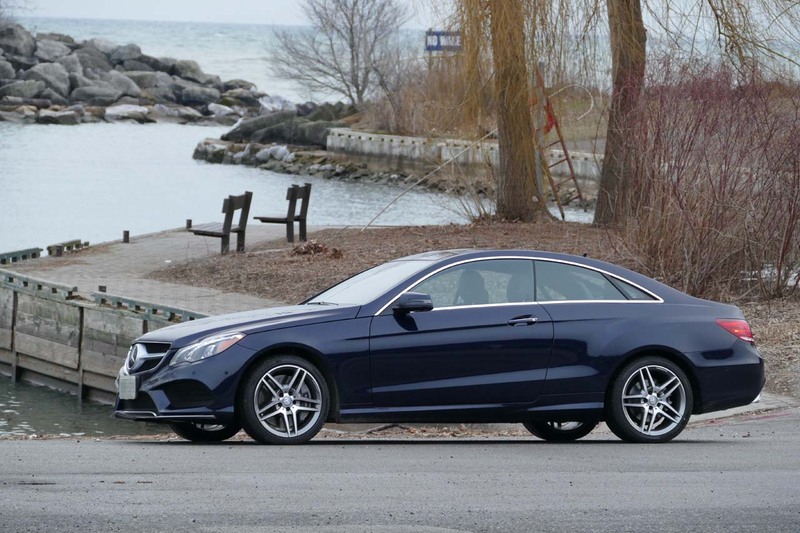 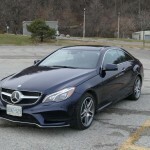 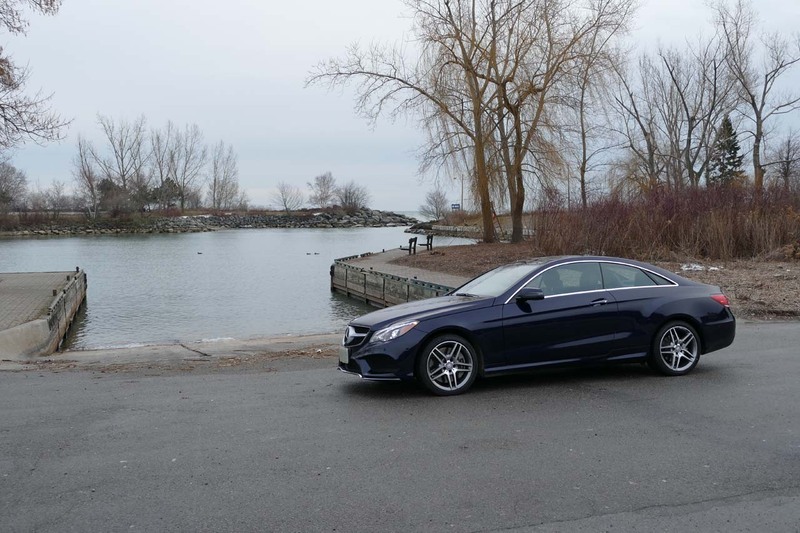 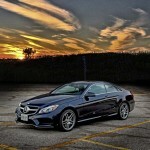 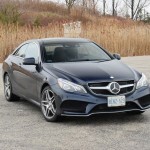 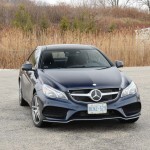 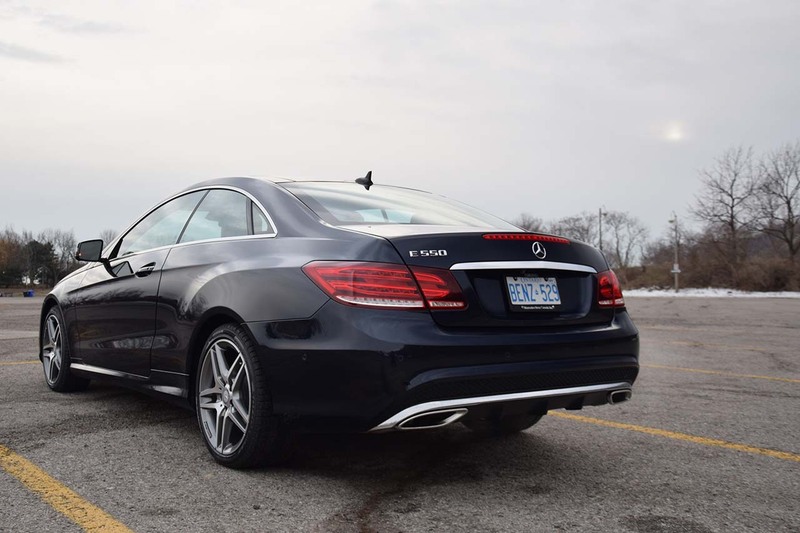 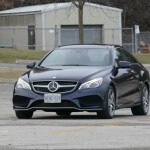 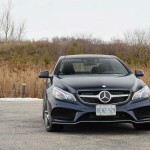 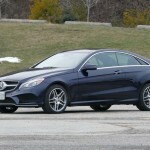 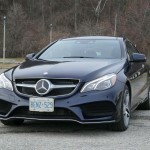 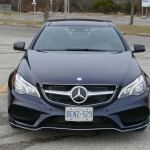 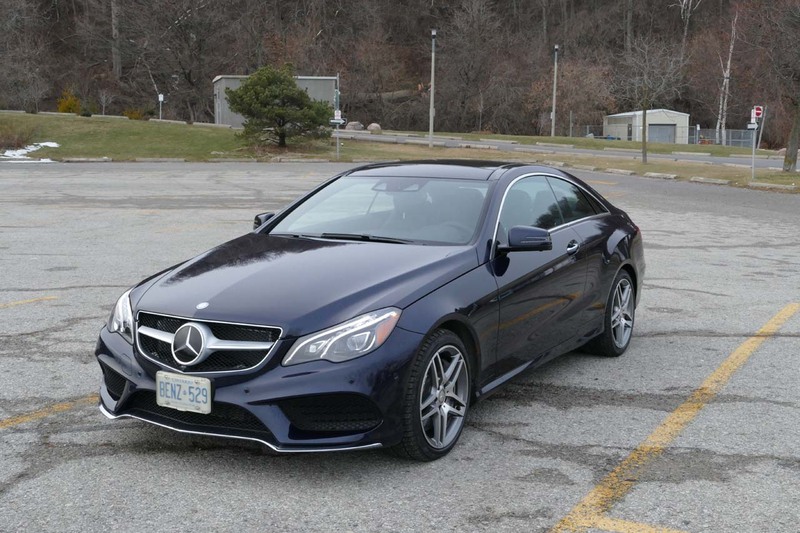 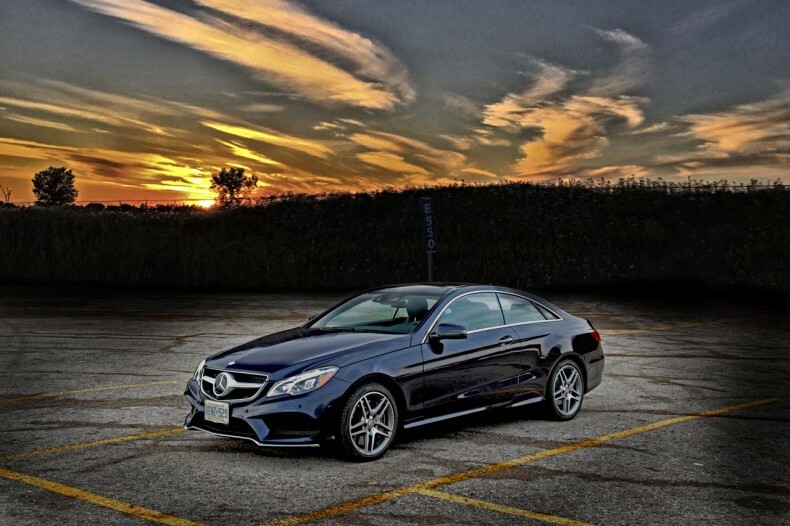 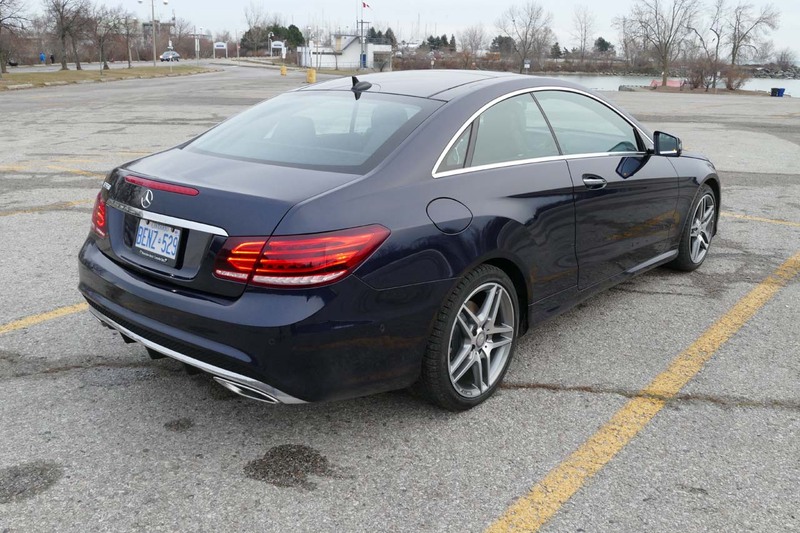 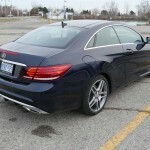 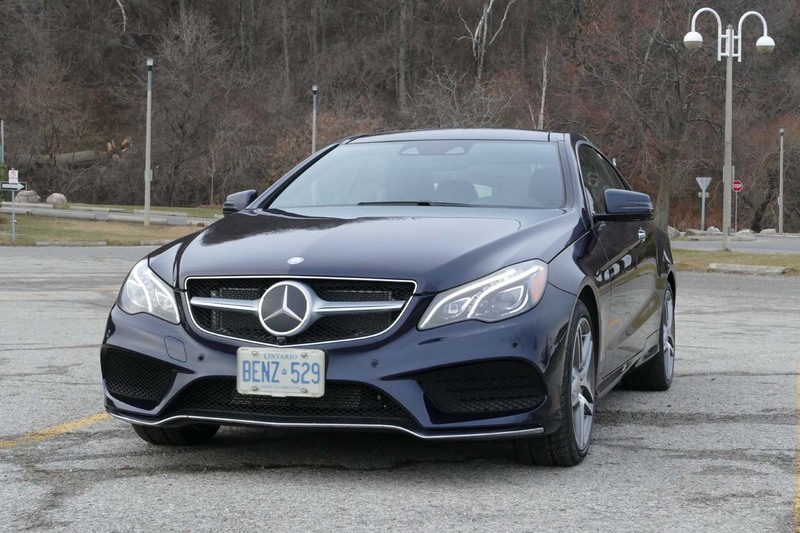 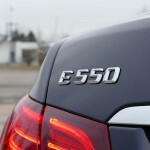 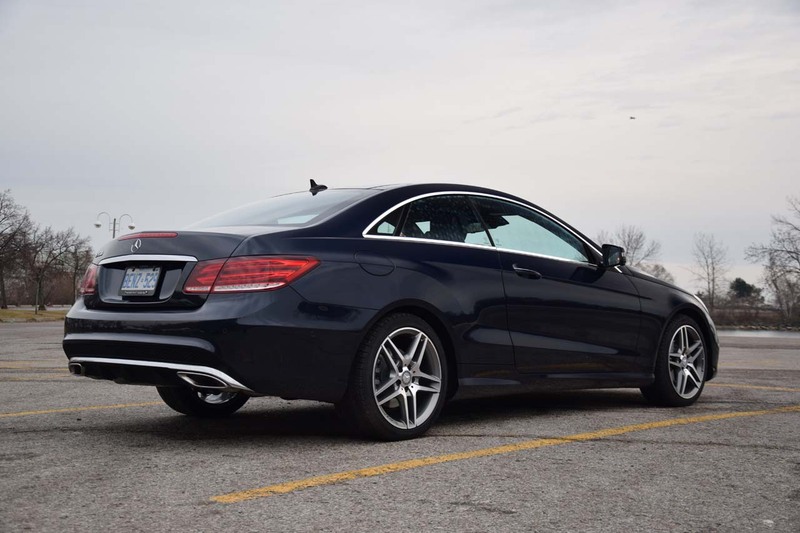 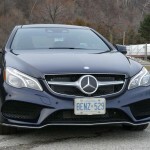 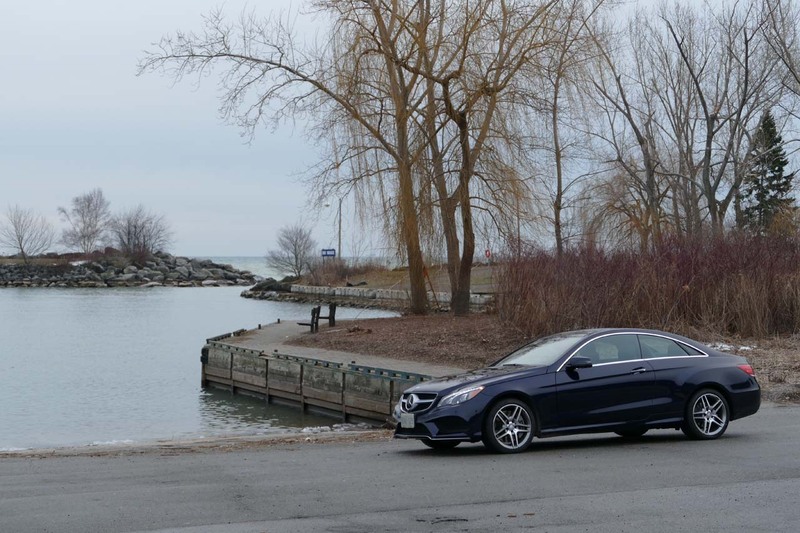 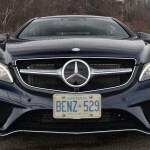 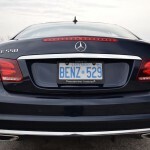 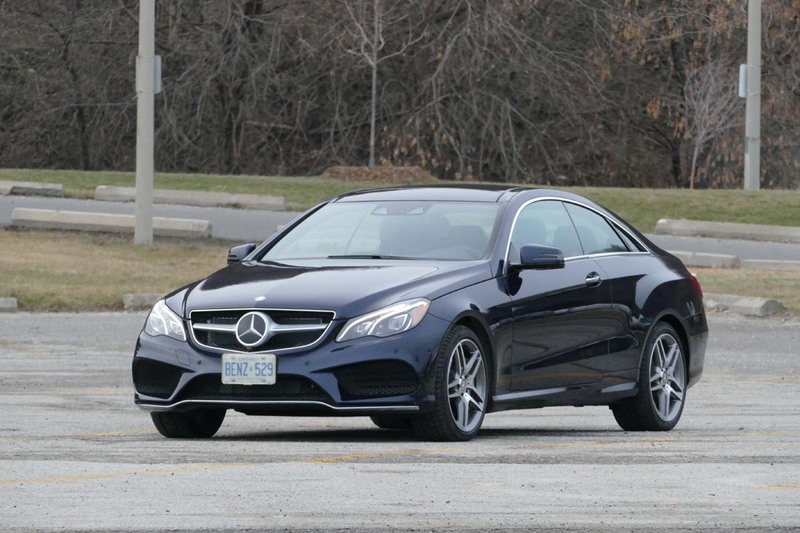 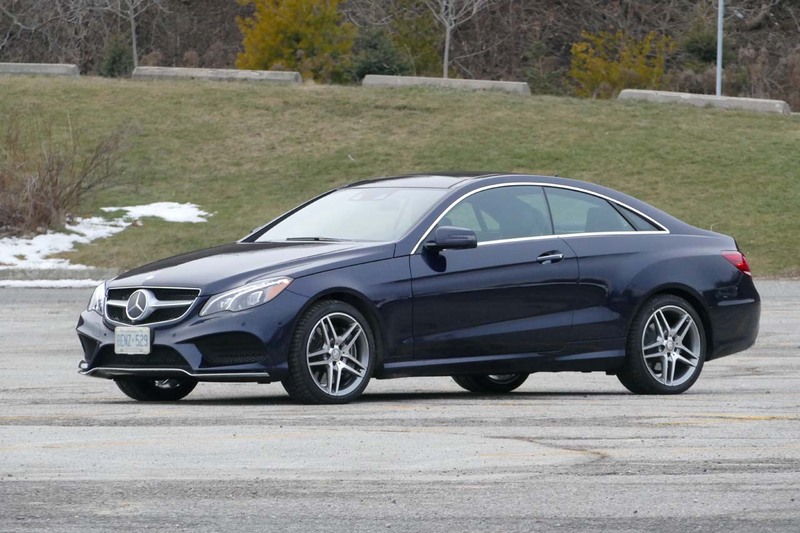 The E550 Coupe is a solid performer and delivers pure class.